Just when you thought things couldn’t get any worse, EVA Air has announced a new jet route which will bring a newly designed Boeing 777-300ER Hello Kitty plane to the US by way of Los Angeles. the new route begins September 18, 2013. For those of you who thought that Europe has escaped this catastrophe, they may have done so only for a brief moment. 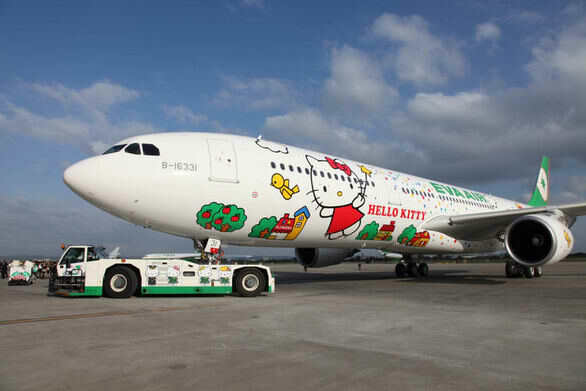 The airline has expressed its desire to torture European countries with an evil feline plane in the future as well. As if the plane itself isn’t bad enough, EVA air has announced that they will be inviting a group of fanatics to fly on this maiden flight who will be able to get on-board autographs from Yuko Yamaguchi, guaranteeing that the plane will be the absolute worst place that anyone could ever imagine being. In fact, if the government was smart, they would require that any known terrorists be placed on that flight because there seriously couldn’t be any worse torture dealt upon a human being (of course, this can’t be done because even terrorists have some human rights). I guess all we can do now is hope the pilot takes pity on the rest of us and wanders into no-fly-zone airspace and gets the plane shot down, but that would indicate that there is actually hope in the world dominated by the cat-with-no-mouth. Everyone, take out the barf bags because you’re going to need them. I would love to be one of their fanatics. The only time I wouldn’t be scared of the plane crashing because I know I’d die happy. Woot! Woot! Sounds like fun to me. Ad photos also show beautiful HK-themed Asian meals served on the airplane. I would kidnap you and have to sit next to me the entire flight for wishing harm on the Kitty. If I had the money I would go for this. Strangely, you got your wish (more than once)… Just a mere 6.5 months later, the first of several Boeing 777’s went ‘missing’… Your thoughts?